Everyone has a drawer like this. Or maybe two or three. Random stuff that accumulates organically over time. The way it seems to creep into that one empty drawer, or hard to reach cupboard, or even a space that’s really convenient and in a prime location. What it really represents is a haphazard array of stuff that you want to keep, but you don’t know what to do with. And seemingly none of the items in the drawer are related to each other. Mostly random one-off items, or things with short-term value. And then they just start to build up. I remember watching a tiny home segment about a man who lived in 70 sq. feet of space. His microwave was the kitchen and he shared a bathroom. Even so, he had two junk drawers. If you’re like me, you feel bad throwing these things away because each item has some use. But then again, it’s not always worth the effort to put it away. So it gets stashed in the junk drawer, to be pulled out at just the right moment, which almost never happens. Usually as I begin the tedious work of cleaning out a junk drawer, or at least “freshening” it up, I’m always holding strange things up and asking myself why I ever bothered to keep this…And yet somehow this exercise doesn’t seem to deter the strange impulse and force to create, and re-create, a junk drawer in every place I’ve ever lived. I have a tendency to be messy, but prefer to have my stuff organized. 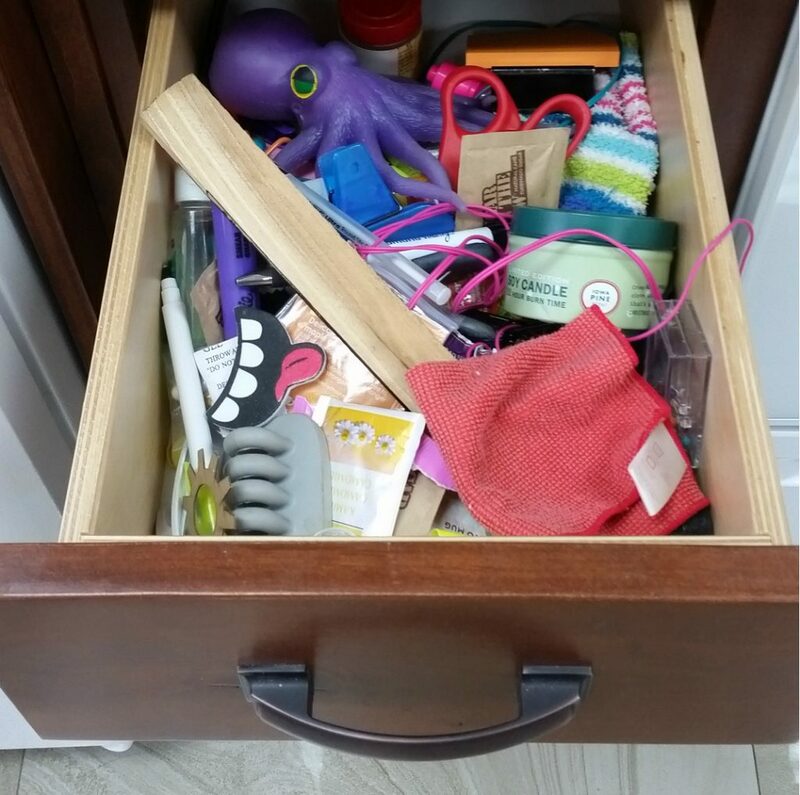 Over the years I’ve developed some strategies to keep things manageable, even those pesky, ubiquitous junk drawers. Have less stuff to make a mess with. I consider myself “low maintenance” rather than a minimalist. My place can usually be tidied up within an hour. Go through “junk” drawers at least once a year. Have designated “use first” areas. When I read this title, I thought, nooooo, please don’t take my junk draw away…..Oh Phew, thanks for letting me keep it, and I promise it will be culled regularly.